I’ve often seen piano teachers state that their goal is to “make themselves obsolete”. I totally agree with this. This blog is to address one way that we can virtually guarantee this happens. One of my last blogs was on a common study program given to academic school students to help them master their subject material. The study program is called SQ3R. SQ3R stands for the study sequence of Survey – Question – Read – Review – Recite. I go into detail into each step of the sequence in the blog found [HERE]. What I have devised is a Mini-Certificate Program for my piano studio that incorporates this study sequence into a plan that I think will guarantee I “make myself obsolete” if adopted and diligently implemented by the student. What I did was to devise five different “mini-certificates” for each of the major parts of the study sequence; Study – Question – Read – Review, and, – Recite. These “mini-certificates” are approximately 1/9 the size of an 8 ½ X 11 sheet of paper. Below is an example. Students are to accumulate these “mini-certificates” throughout the academic year. Each major assignment can be adapted with a mini-certificate in mind. As the student notes these points they should mentally think of what they mean and imagine playing them. Imagine playing the A minor scale. Did you include the G sharp? Imagine playing the Am and Dm chords. Imagine playing the two sixteenth note patterns. This mental preparation is highly important and should not be neglected or slighted. It’s like the construction of a new structure. The laying of the foundation takes a great amount of the total time it takes to build the building. There is much preparation that needs done even the substructure of the building is put in place. I do this type of survey work from the very beginning of a student’s piano lessons. This type of work must be taught. Students do not do this type of work automatically without instruction. The natural impulse is to begin playing the piece; no preparation is considered necessary. Students just lunge into the sight reading cold and the results are not near as good had they “surveyed” the landscape before trying to play the piece. The best way to teach students on how to survey their music is by doing it with them. Ask the student questions that lead them to the answers to points given above. By all means have students write on their scores through this Survey Stage. As students learn how to survey their music, slowly have them take over more and more of the survey process. Even when students can begin to survey on their own don’t stop helping students in surveying their music. Rather, become more detailed. In Arabesque you could point out tonic, subdominant and dominant chords and a little bit about functional harmony if this is a proper time to pass this kind of information to the student. Of course, all students will learn how to survey their music at a different pace; but the important thing is that all students learn to make surveying a part of the procedure they use in learning new compositions. THIS is how we can “make ourselves obsolete” and turn our students into independent learners. A very small handful of students learn how to do this without any instruction and a few more can learn it at a low level of expertise; but, with our persistence all our students can learn how to do this if we make it a part of our teaching approach. I feel this will go a long way to helping our students learn to not only sight read music better, but just read music itself better. Music notation can be a very clumsy way of communicating musical ideas. With most beginning students reading flats and sharps can really slow down their reading; especially if it’s part of a simple chromatic passage. 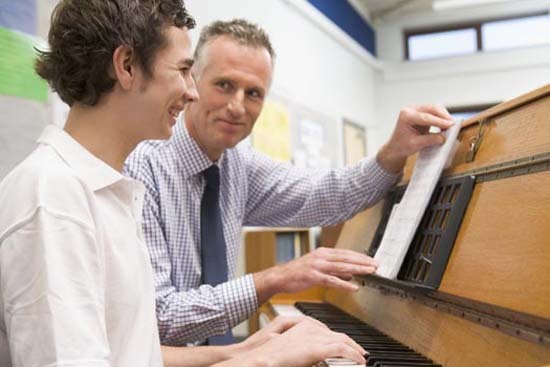 BUT, if I point out the chromatic passage and SHOW the student the chromatic passage by actually PLAYING the chromatic notes on the piano keys where they SEE the movement of the notes played instead of slogging through the music notation they can often play it, or at least begin to play it more fluently, almost immediately. In my early teaching years there was the common thought that doing this type of activity would actually hinder the student’s ability to read music well. My experience has brought me to see it differently. Again, music notation is often a very clumsy and cumbersome way to express musical ideas and compositional procedures. If teachers can find other effective means that will facilitate learning and teach these effective means to their students, they should not hesitate to do so. Often, I will then get out my yellow highlighter and highlight the chromatic notes to remind the student of what we learned so, in their practicing at home, they can increase their learning curve in mastering the composition. I think an important part of the teacher’s job is to help the student see these simple music ideas that standard music notation tends to obscure. The way I’ve decided to apply SURVEY to our SQ3R MINI-CERTIFICATE PROGRAM is to award a student a mini-certificate for each four compositions a student surveys. As I said, at the beginning stages of learning I will be doing most of the surveying; but this is done through leading the students through a series of questions to help students arrive at the “points of interest” that will help the student before their initial reading of the composition. For example, to a beginning student I will ask, “Where in this composition do you see steps?” ,or, “Point out places where the music skips”. Also, I will, as soon as possible, ask for the student’s input without any instructional coaxing from me. This is often done as a check to see how much the student is absorbing in their ability to survey music. As the student begins to get the hand of surveying they will become more and more responsible for their survey work on their compositions. A teacher can also ask a student to survey a composition that you’re planning on assigning the student the next succeeding lesson. This will help the student to develop the practice and habit of surveying their new compositions. As they students complete their surveying work I will have place a blue dot on the corners of the mini-certificate. 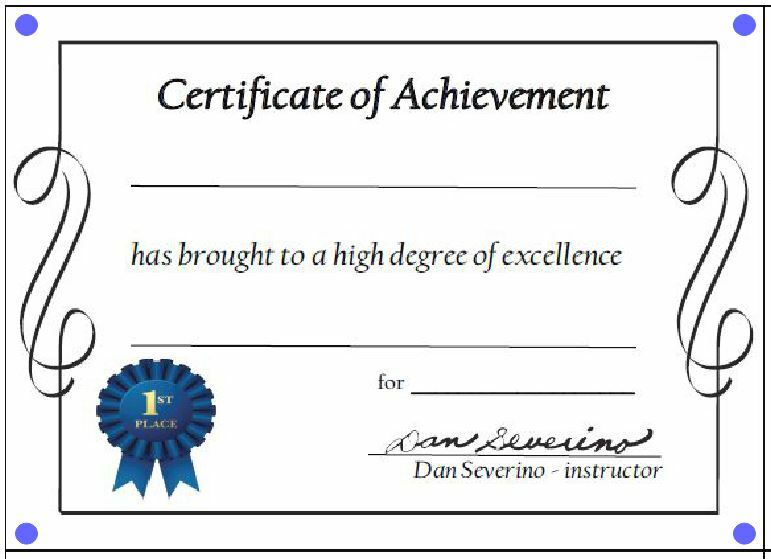 Once the certificate has blue dots on each corner the student is awarded the mini-certificate. Students are asked to see how many mini-certificates they can receive through the academic year. I think good directed instruction in helping students to survey their musical compositions will go a large way to helping “making ourselves obsolete”. Stay tuned for PART 2 on my SQ3R MINI-CERTIFICATE Program. To make sure you don’t miss an installment please subscribe to Blogging at Piano Teacher Press.